My sister Stephanie is coming over for dinner and she loves burrata, so what to do? 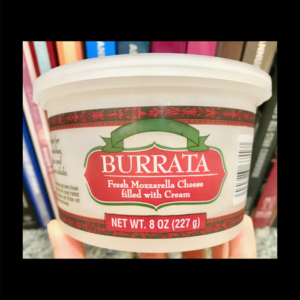 Buy burrata of course! Now some backstory here, Stephanie is the founder of Maman Kitchen- a very well known Los Angeles based catering company and private chef moniker for my sis. Maman Kitchen is a big fan of stone fruit with burrata, but there wasn’t any ripe stone fruit when I went to the store to shop for our dinner so I bought some different fruit options for the burrata salad. Essentially this recipe is a collaboration of Maman Kitchen and Katrina’s Kitchen! Prepare a nice big bed of clean fresh spinach or baby spinach. Either is fine. 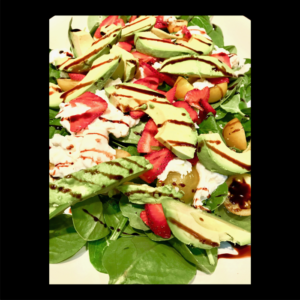 Then add sliced mini yellow heirloom tomatoes, sliced strawberries, sliced avocado and burrata. 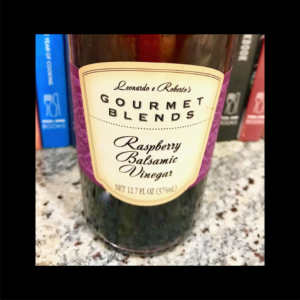 Drizzle the top with avocado oil and raspberry balsamic vinegar by Gourmet Blends. Sprinkle it all with a hint of sea salt and your salad is ready to serve. It’s that simple and so delicious. 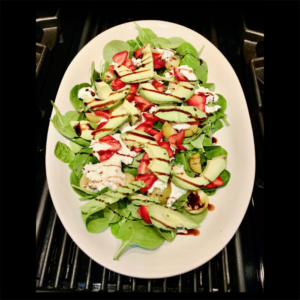 Vegetarian, paleo, side dish, salad, cook free recipe.